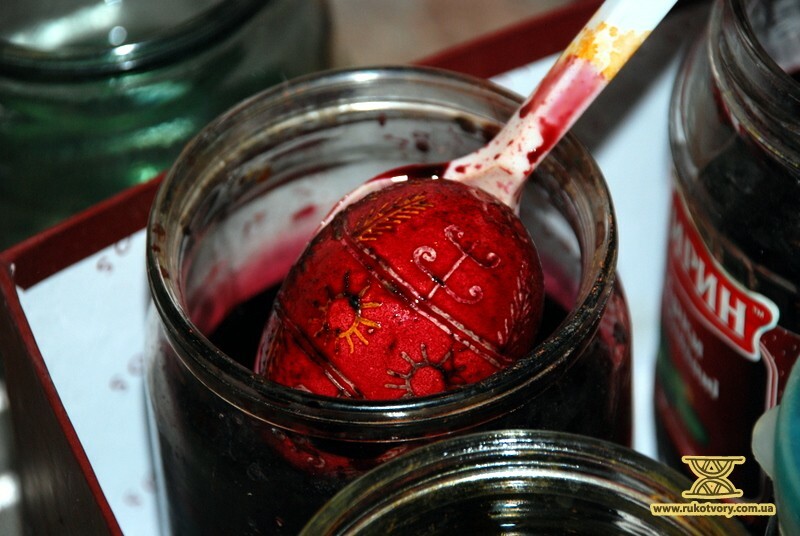 Usually, eggs are painted both before and after the Easter. 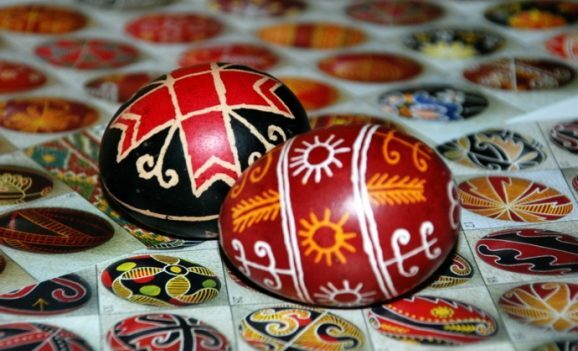 People begin ornamenting pysankas starting from Candlemas Day (February, 15th). 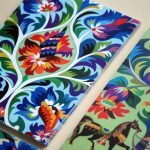 The process lasts until the “Green holidays” or Whitsunday which falls on June, 12th this year (2011). 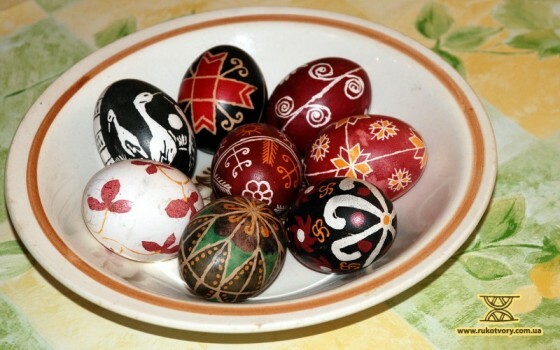 So everyone who hasn’t ornamented any pysankas (pysanky — Ukr. pl.) yet is able to do this within the next month and a half. There’s nothing complicated in the process. First it is necessary to dilute dyes in water. For this, take half-liter glass cans, filled for 2/3 with water. The water temperature should be of 38-420C. 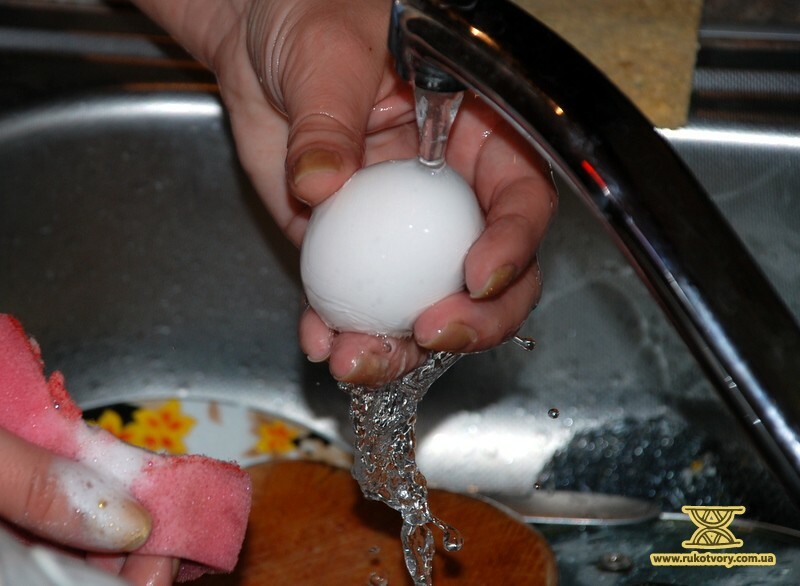 The chosen egg requires thorough washing with warm water and careful drying with a towel. 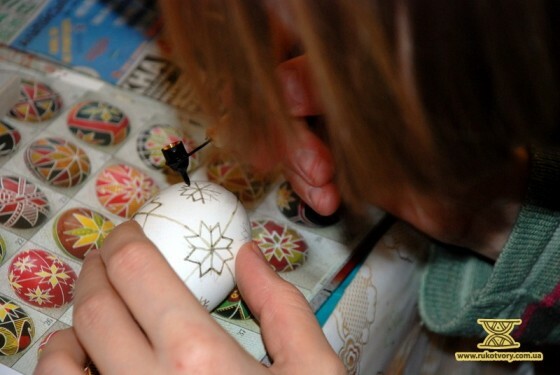 By light touches, draw the pattern lines of the chosen ornament on the egg using a pencil. Warm up the pysachok in the candle flame, fill it with wax and apply the wax to the lines and places which are to be white in accordance with the pattern. Dip the egg into vinegar for several seconds; take it out and put into a can with yellow paint (or any other paint of light shades) for 2 – 3 minutes. 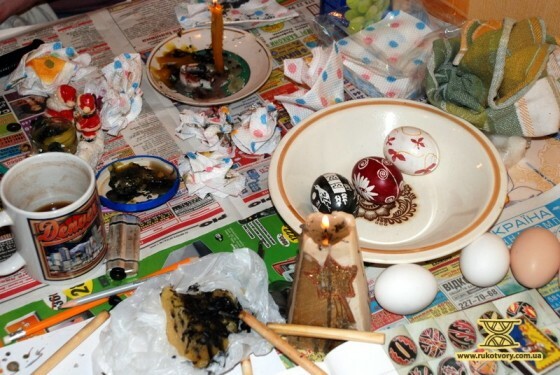 After taking the egg out, wipe out the paint remains carefully. 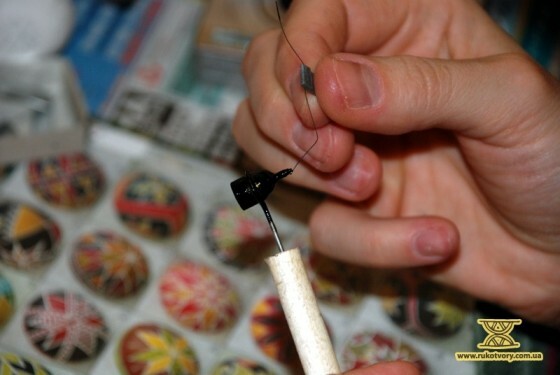 Apply wax to the pattern details which are to remain of this very color. Repeat the process with all colors, starting from the lightest and finishing with the darkest ones. In the end, dip the egg into the black paint. 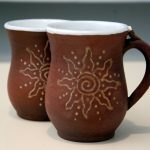 There are several secrets for obtaining bright pysankas. It’s seen in the picture that paint on several pysankas is pale. So, what does the secret lie in? — Vinegar is the matter. 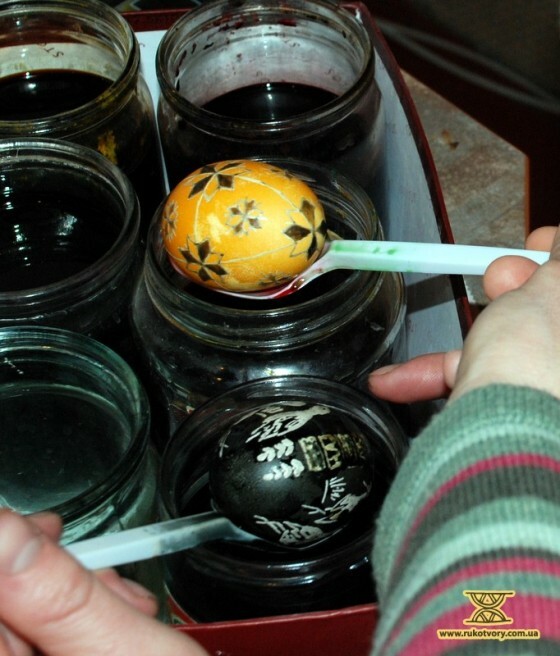 It is necessary to dip the egg into the undiluted vinegar exclusively before the first coloring after the first wax lines are already applied. One should take the egg out of the vinegar very carefully, almost not touching the egg shell (because due to the vinegar impact the external layer on it softens and any touch can wipe this layer away, which makes it impossible for the paint to penetrate deeper) and dip this egg into the paint instantly without wiping it. Now, the paint has stuck to the egg shell well enough! — After the entire pattern is covered with wax and colored in the last chosen paint, some masters dip the pysanka coated with wax into warmed paraffin for the egg to acquire a thick paraffin cover: this will allow for “painless” blowing out of the egg yolk and white. For this, it is necessary to make an opening at the egg’s blunt end with a thin file or a thick needle and to blow the egg contents out using a syringe. Empty egg is washed with clean water. 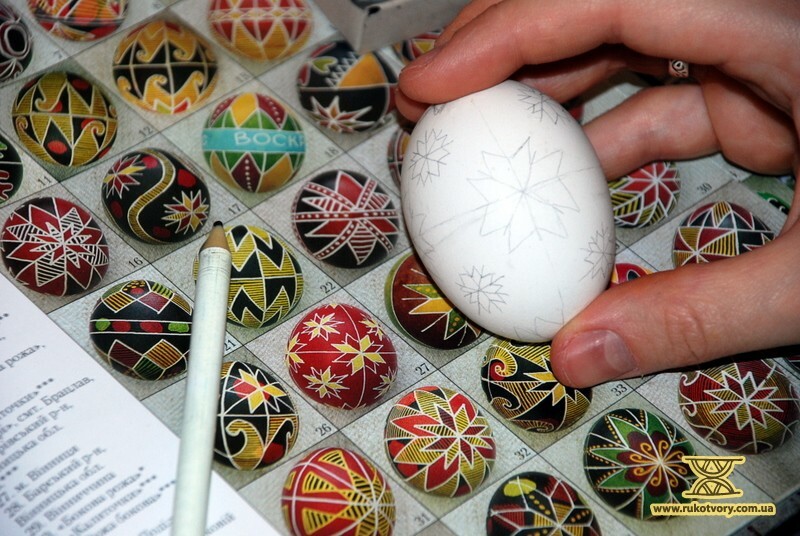 The next step is cleaning pysanka from wax. 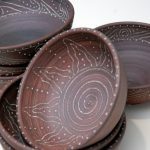 For this, it is left in a special holder in a slightly warmed oven (the temperature should be about 500C) until wax and paraffin are melt down. After this the egg is taken out of the oven, wiped with clean cloth and rubbed with vegetable oil. The wax can be wiped off the egg over candle flame. This process needs attention. If the pysanka is left over the flame for a long time, it can be charred; in this case it will be difficult to get rid of the black burns. 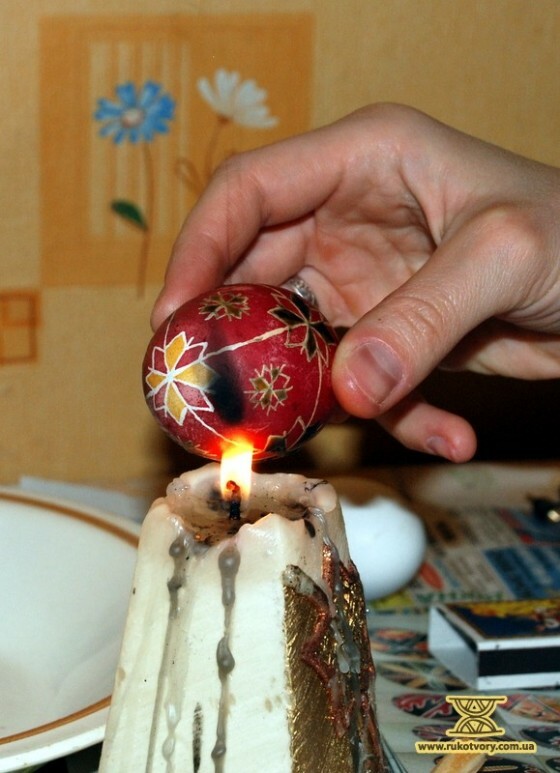 That is why each time you should take the pysanka to the flame for only a moment quickly wiping the melted wax afterwards. — Only one pysachok can serve a master for a long time. It happens a pysachok gets clogged after a long break or in the process of pysanka ornamenting. 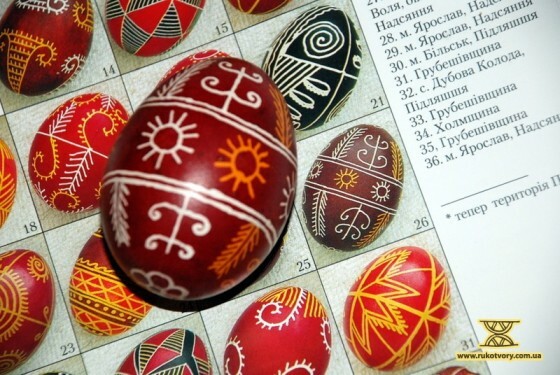 To be as beautiful as a pysanka!